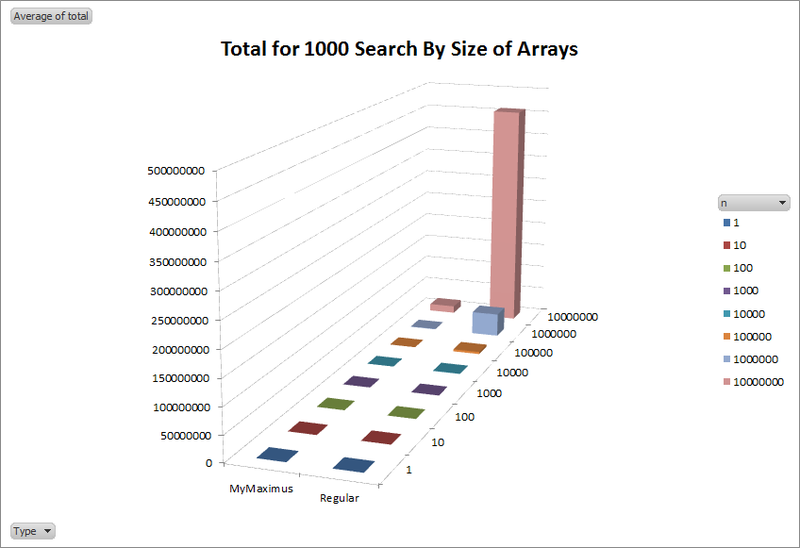 "What's the fastest algorithm to find the largest number in an unsorted array?" To repeatedly find the largest value of any array supplied to a function is O(N). You have to look at each element once, since you're checking if it is a new maximum. However can we do better? 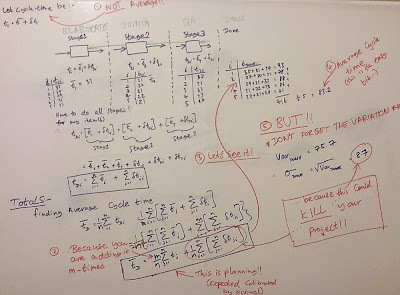 I postulated this left of field idea in response to a comment from the original poster, which stated their lecturer asked them "what is it that an array automatically has which may be used to improve on this?" 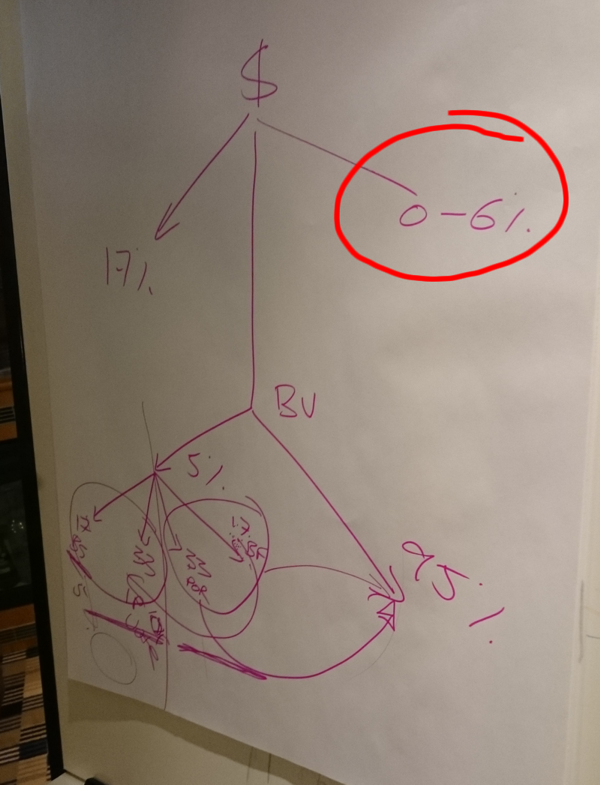 "How about setting the array 'Base' address (pointer to the address of the first item) to the largest number? After all, all you want is the one dereferenced pointer value. 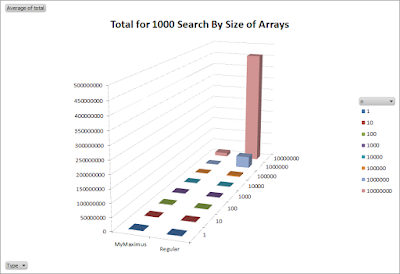 Not to sort or search the array. So you're then effectively always reading the value at address array. Therefore O(1) each time"
In principle, this is the same as other answers appearing which propose storing the index of the maximum location as you build the array. Now, just reading the Maximum property gives you the maximum value. You can alternatively substitute the value of Maximum to be the index in the static function and you have what I was suggesting. The expectation is you'd substitute a reduction in array build time on building for the read time when locating the maximum item in the array. This is particularly suitable where the data doesn't change. So, the proof of the pudding is in the eating. Hence, I wrapped the two of these this up in a little console app with a tick-timer which read the ticks at the start and end and output the result, including for the sub-phases of building the array and reads of the maximum. For those people unfamiliar with ticks, they are a measure of 1/10,000 of a millisecond (1/10,000,000) which is sufficient for most applications. The tests were each run three times, over a logarithmic scale from 1 to 10,000,000 and an average taken across the three. The algorithms were then modified to behave as if they would be written to once and the maximum read many times. 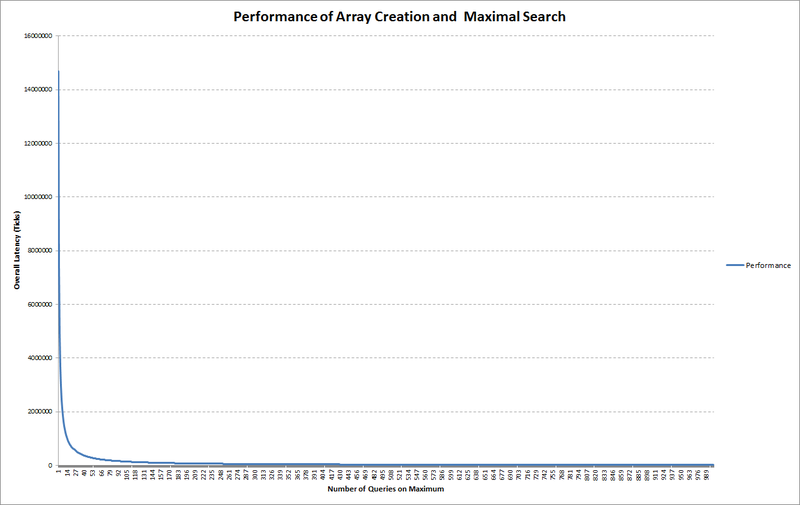 The expectation would be the 'search optimised' algorithm (MyMaximus) would perform worse than the regular algorithm when first building the array and sure enough it did, though surprisingly, not as much I thought. Both algorithms on this stage of the process would be O(n), with only a difference in coefficient. The 'doubling' due to the introduction of the if comparison didn't quite occur, though I speculate this may be due to JIT optimisation on the .NET platform. The reason it is zero is that I am running this on a 4 GHz system, with a 20x clock multiplier and 1866MHz ram. All in all, this means it can carry out a CPU cycle including memory access (the slowest part of this process) therefore one read instruction occurs every 0.000000000526 of a second, which if a tick is 0.0000001 of a second, will never register. Hence, this result. The combination of build and run fulfils the full scenario. 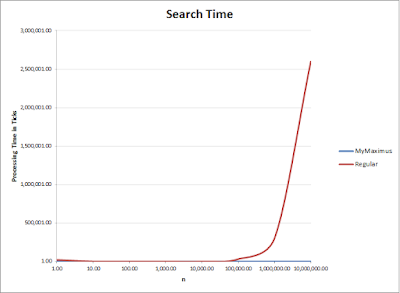 Here, we expected the MyMaximus read to achieve similar asymptotic performance on the single run, but perform substantially better on the continual searches, tending towards $\Omega(n)$ the more searches that happened. 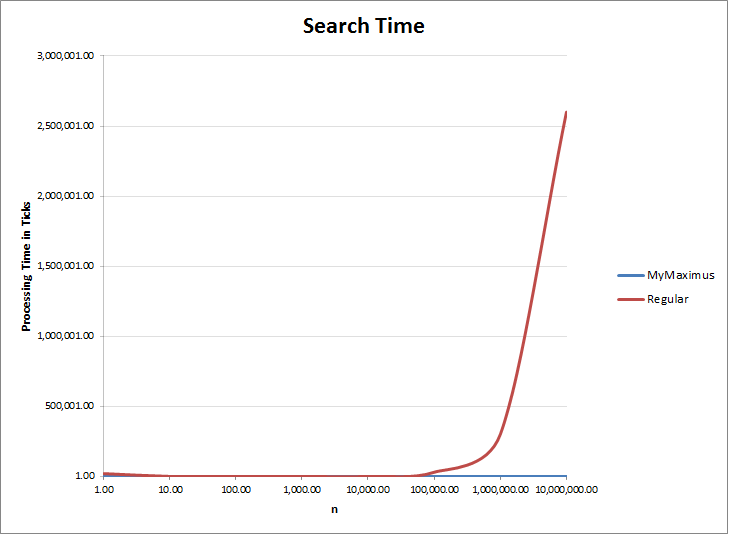 So overall, the performance of MyMaximus versus a regular search resulted in a small and I'd argue insignificant (chi-squared another day) win in the single search case. 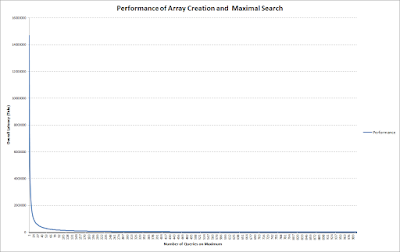 What happens in the case of the array being queried for it's maximum multiple times? 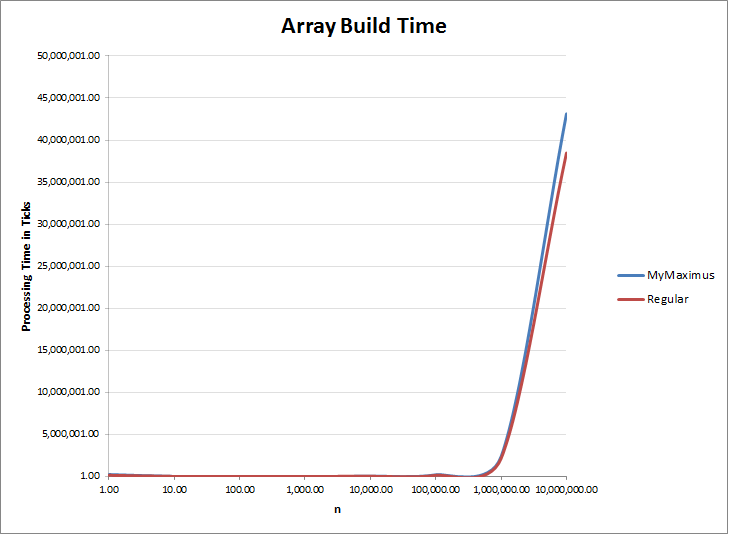 The expectation is that the average will start off about the same when building the array, but the performance of the queries will be much faster with MyMaximus. It's pretty straightforward. The lower bound of the MyMaximus algorithm is $\Omega(n)$ whilst the lower bound of the regular algorithm is $O(n)$ and that's the best you can do. So MyMaximus tends to the lower bound over time, whilst the regular algorithm does not. The context of a particular algorithm is as important to the asymptotic complexity as the individual optimisation itself. This is well a known idea in Electronic engineering, as logic circuitry, such as NAND gate representaitons of other circuitry, are often evaluated to remove unnecessary gates and save money. Here you're doing it to save time, which in this era of cloud computing, also happens to save you money and indeed, losses if customers are not put off. It's Monday. I didn't have a Saturday or Sunday, since I was enjoying myself at BarCamp Manchester 2015. If you're not familiar with what a BarCamp is (which I wasn't really until his weekend), it's a form of 'unconference' with no scheduled speakers. The attendees are the speakers :) The rules of Manchester BarCamp included that anyone who hasn't spoken before MUST speak. So in a panic, I hastily put together one presentation on the Saturday to get out of the way. I also didn't know what I should be pitching, despite the fact I could have picked any subject. I have a lot of interest in so many things it makes it really hard to choose sometimes. So figured I might try two at a push. The first on Saturday was entitled... well, "Sh*t that moves" which I learnt led to people thinking it was about robotics (one of those "Oh yeah moments" - *bomb*) the other on Sunday I decided to make much more specific and less click-bait like. I decided to focus on something I hadn't really picked up in 15 years and that topic was Genetic Algorithms. By comparison, this talk seemed to go down better *phew* and I'd like to give my thanks to those who have provided that feedback. Much appreciated. Many folk also asked if I have a blog (yes) and also asked me to post my code on JSBin/JSFiddle, so I did yesterday and am now following this up with this post to explain the concepts and go through the code in a little more detail. Genetic Algorithms are considered by many a branch of artificial intelligence. Personally, I don't think that's entirely correct, as it's more in the realms of distributed multi-agent systems and the software side of BIMPA. The intelligence in such systems is contained in the ability of the agents to solve a problem or to search a space as a population. A rough comparison is it's like 'wisdom of the crowds' but operating through genetic or memetic transfer of information. These concepts can also be applied to programming in such a way that programs built from scratch solve problems more effectively than humans have done coding traditional algorithms. As is often the case, the complex behaviour of the population is non-linear even though an individual member's rules of reproduction are inherently simple. 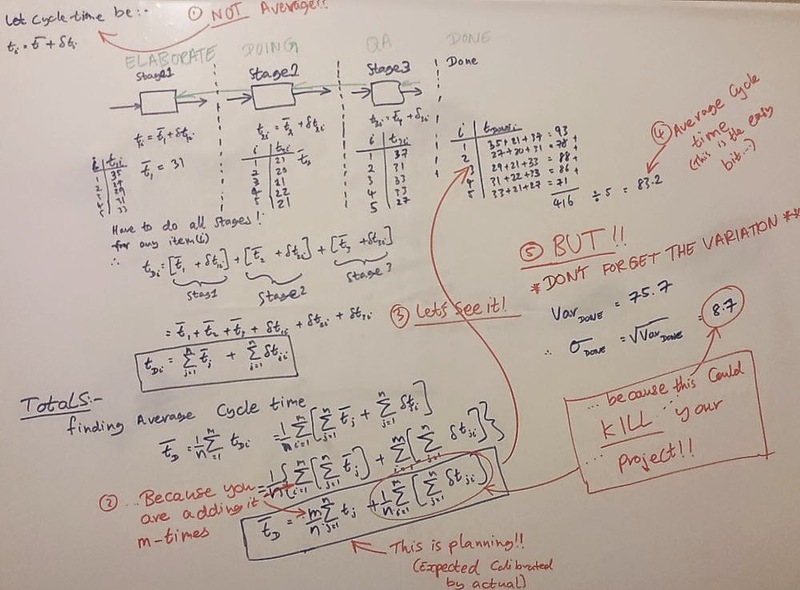 As hinted, a genetic algorithm, just like monte-carlo approaches, uses multiple agents or samples to determine solutions to the problem you're trying to solve. Each agent or sample contains an encoding of the information you wish to find, akin to a genetic sequence in biological systems. They start very often from a random sequence and through a process of one or more cross-over of a subsequence of that genetic code with a fit member of its cohort and potential mutation of one or more characters of the encoding string, it produces children (usually two children per cohort-pair) who share ideally, the best characteristics of each parent, perhaps with a 'genetic mutation' which takes in the population, or dies out over time. Often, when the entire cohort completes its reproduction, that is considered a generation. Members of the preceding generation may remain or die out depending on the approach to the problem you're trying to solve. In order to determine how close you are to something, you have to know two things. Firstly, what or where it is you want to get to. Secondly, where you are now. If you don't have either of those two things, you can't measure how fit a solution is for purpose. Any measure of displacement is conducted through a distance metric, usually comparison what I call the 'utility' of something with the point you're trying to achieve, which in genetic algorithms is very often used to determine how fit a solution is for the purpose it was evolved for. Opening up the trivial JSBin example here, you'll see the scrap code I put together (I keep reiteratiing the shame that it's not productionisable - especially since I break Single Responsibility in it. Oops!). All it aims to do is evolve towards an ideal string, in this case provided by a user in the text box labelled "Fitness string:". I slowed it down to make it easier to see the operation via a visualisation of all agents below it. The visualisation is shown on the rightmost JSBin frame. A population of 100 agents is shown in the grid of circles. Here the fitness of an agent is decided using a hamming distance between the ideal (targetFitness) word and the agent's genecode. A Hamming distance is just the number of positions where two strings differ. For example, John and Jean have a hamming distance of 2, Jen and Jon have a hamming distance of 1. Jim and Jim have a Hamming distance of zero. Since we're trying to find the closest match, we are looking to define the shortest hamming distance as the fittest organism. However, this can equally apply to longest, biggest, fastest, least number of steps, richest etc. etc. depending on the problem you're looking to solve. If you are familiar with TDD/BDD, this may seem strangely familiar. The goal is your acceptance test criteria, the initial condition is where the agents start and the actions, how it gets from pre to post-conditions you don't care about :) Kind of how you'd hope managers/architects leave devs to fill in the gaps. In this code, all I am doing is taking the top 33% when sorted by fitness and breeding them.There is no reason they can't breed across other parts of the population, but this may take longer to converge on the solution. When the button is clicked, the population breeds. I count the number of generations for convenience. Yes, the circles. The darker the circle, the shorter the distance from the goal. A fully black circle, (hex rgb = #000000), hits it straight on (I circle the winning members in green when they achieve it). The lighter the circle, the further away it is from the fitness goal. Note how the cohort responds to longer strings of characters, how long it takes to get to a solution etc. also run exactly the same test twice and see how the different start configurations change the number of generations required to reach the goal. Are there any you've found which don't ever seem to get closer? Yes, that was deliberate. This was an extra function I put in which simply counts the alphabetic distance between the characters in the strings and adds them. This then becomes the distance metric. There are crucially many ways (and combinations of such ways) you can use to change how the population evolves. Play around with any or all of these. It would be interesting to see what you come up with. If you have any questions, drop them in the comments and if pertinent, I'll update this post to answer them. Genetic algorithms are not new. They've been around for over 20 years and was heavily into them at the turn of the millennium. I was spurred to give this talk after Rosie Campbell's talk on the "Unexpected Consequences of Teaching Computers to See" (which was hilarious! I have to say! So I nicked the concepts on one slide to illustrate problems with mutations - but she played a vid from 20 years ago which showed evolving virtual lock animals). There are places where Genetic Algorithms work well. Evolving solutions or programs. However, there are some major drawbacks, including the fact it needs to be 'trained' (either supervised or unsupervised) and hence, have very little productive usefulness for a long time. As I mentioned in the talk, sometimes 'champion-challenger' algorithms perform better since the approach can be used with production data 'out of the box' and the fittest algorithm evolves as it goes. I attended the Lean Enterprise session last night at ThoughtWorks Manchester. Speaking were Bary O'Reilly and Joanne Molesky, who coauthored the upcoming Lean Enterprise book with Jez Humble. I happen to like Barry O'Reilly's work. As a lean practitioner, I don't think I've ever disagreed with anything he's said (at least, not to any significant degree - believe me, I try :). Whilst I came into the venue and fumbled my way to a seating position with folded pizza slices in hand, they had just started speaking (thank you Manchester City Centre for having so many roadworks going on at the same time that I had to U-turn on myself 3 times to get in). I am always interested in looking at how companies close the feedback loop. i.e. how they learn from the work they've done. Not just learn technologically, but also about their process, about themselves, their culture and how they work. I'm a great advocate of data driving retrospectives. Hence, I always find myself wanting CFDs, bug and blocker numbers and a generally greater understanding of how we're developing in a particular direction. Which benefits us <By this amount>"
When working in build-measure-learn environments, including those in lean environments, the learning process aims to become more scientific about change. If the result is positive, that's fine, since every organisation wishes positive change. However, if it's negative, that's also fine, since you've learned your context doesn't suit that idea. Spending a little money to learn a negative result is just as valuable, since you didn't spend a fortune on it. The only real waste when learning is spending money on inconclusive results. Hence, if you design an experiment which is likely to yield and inconclusive result, then you are designing to spend money generating waste. For those who use TDD, you might be familiar with this term. If you run unit tests, you might see the odd yellow dot when the test doesn't have an assertion (async JS programmers who use mocha may see it go green, oddly). This is a useful analogy, but not wholly correct. It isn't just that you're not measuring anything, which is bad enough, since most companies don't measure enough of the right stuff (hence, most of the results of expenditure are inconclusive in that regard), it's also concluding an improvement or failure under the necessary significance threshold. The significance threshold is the point at which the probability of false results, the false positive or false negative is negligibly small and you can accept your hypothesis as proven for that scenario. Statisticians in frequentist environments, those which work off discrete samples (these map to tickets on a board tickets), are very familiar with this toolkit, but the vast majority of folk in IT and indeed, businesses aren't, sadly. This causes some concern, since money is often spent and worse, acted on (spending more money), when the results are inconclusive, there is not just no uplift. Sometimes it crashes royally! So you can be quite comfortable that you're going to get 5 heads in any ten flips with any ten fair coins. However, if you look at zero heads or all heads after all the flips, the outliers, these are not very likely. Indeed, if you get your first head, the probability of getting zero heads in 10 after the remaining 9 have been flipped as well is obviously zero (since you already have one). Now let's suppose we run the experiment again with the same number of coins. An A/A-test if you like. Let's suppose we get 4 heads. Is that significantly different? Not really, no. Indeed, many good researchers would consider a significant difference to fall at either 0 or 10 in the above before they call a change significant. Indeed, an unfair coin, one which has only a head or a tail on both sides will give you exactly that outlier (all tails or all heads). Anything before this is regarded as an insignificant change. Something that you already have knowledge for or can be explained by the existing context, not the new one the team delivers, or 'noise'. Why is this important in lean enterprises? In business, you spend money to get value. It's as simple as that. The biggest bang for your buck if you will. Positive and negative results, those that yield information, are worth paying for. Your team will be paid for 2 weeks to deliver knowledge. If there are 5 people in the team, each paid for two weeks at £52,000 a year each (gross, including PAYE, employers NIC, pension, holidays, benefits etc.) that is £10,000. If the team comes out with knowledge that improves the business value by 3% and the required significance level is a 7% uplift, this value addition is insignificant. Rolling this out across the whole enterprise will cost you significant amounts of money, for a result which would likely happen anyway if you left the enterprise alone. At the end, you'll be down. Lots of consultancies which have delivered positive results have actually seen this sadly. However, as Joanne rightly said in the meetup, it's often just as easy to do the opposite, and miss opportunities because you didn't understand the data. The false negative. Teams have to be aware of that level of significance. That depends very much on sample size. You need to get a big enough sample for the 'thing' you're trying to improve. Significance levels also generally depend on that the degrees of freedom (how many possible categories each sample can fall into - heads or tails) and the probability of false positives and negatives. If you have a pot of £1 million, each costing £10,000 you can run 100 experiments. You need them to be conclusive. So select your hypothetical number for acceptable value, the threshold beyond which a credible change can be deemed to have occurred, before you spend the money running the experiment. Otherwise you won't likely just lose the money to gain zero knowledge (pressure to declare a result conclusive which isn't, is just another form of the sunk cost fallacy), you may end up spending more money on a result that isn't credible and it will most likely bomb (check out Bayesian stats for why), or also miss opportunities for growth adding value or something else. As a result, I'd argue that you need to know the hypothetical sample size requirement (there are tools out there to do that), but also remember to stop when you reach that sample size, not before (since you'll destroy the credibility of the experiment) and not too long after (since you're getting no significant increase in extra knowledge, but you are still spending money). ...And the battle rages on? It's 8am here in the UK and I am still simmering over a twitter storm from about 3am my time. 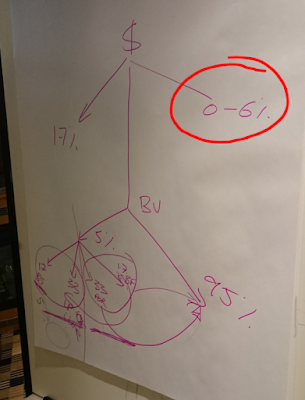 I made the mistake of looking at my phone after going to the bathroom (I washed my hands) and noticed more on the #NoEstimates conversation. It all centred around the heated discussion the other day on #NoEstimates, except this time it got personal, with a few members of the discussion choosing to do the tabloid headline thing of taking one part of some of my material out of context and then basically making libellous inferences. I don't mind a heated debate at all, as long as it stays fair, but I was somewhat disgusted with the actions of a few folk, especially since they purport to work with probability and statistics, which folk who know me well, know is exactly my area of specialism in this domain. If you want to read the full article on my LinkedIn blog post and see how it's out of context, it's here, as opposed to reading the tabloid rubbish. They obviously TLDR or were out for the vendetta as opposed to admit where they were wrong. Too much riding on it I guess. Needless to say, twitter is a really poor forum for these sorts of discussion (which is pretty much the only thing me and @WoodyZuill agree on). So I figured I'd explain it here, in a bit more detail, then post it back, as those folk are hell bent on not admitting their lack of understanding and fighting with people on 'their side' of the debate and to do that, needs a lot more than 140 characters to explain the gaps. However, before we get into how they fit within the discussion of estimates, we need to bridge some gaps and answer some criticisms. Now, I hate 'buzzwords' as much as the next guy. However, we in IT are probably more guilty of creating and using them than any other industry. Indeed, particular communities of practise create buzzwords that only those in those communities understand. Therefore it is a kind of 'private joke'. However, here's the rub, you can't get away from it. They are always necessary to succinctly communicate a concept. 'eXtreme programming', 'design patterns', 'TDD', 'Refactor' they are all examples of words used to communicate concepts in our domain. They mean nothing outside it to anyone not connected to it. So those people see it as a 'buzzword'. Is that their problem or ours? Similarly, because we in software development are often in no way connected to accountancy and finance, when see words like 'NPV', 'IRR', 'ROR' we in the main don't get an illustration of the concepts in our minds. Hence, we see them as buzzwords. Their problem or ours? So, hopefully we should now be on the same page around 'buzzwords'. Cool? No? Do we not like hearing that? When working in an organisation, you're always going to have to justify your work's existence (sometimes even your salary/fee). It's how businesses work. Why are we doing this project? What is the business case? How much is it going to cost? What benefit am I getting out of it? The answers to all these questions are all estimates. Yes, we hate them because we are often held to them. However, being held to them is a people problem, not a problem with estimates. Business are held to estimates all the time! Estimates are naturally probabilistic. What is worse is that the further out you look, more uncertain that probability becomes. To expand on a previous post from the past, using insignificant data volume as an example, if you imaging you have to deliver one small task and you estimate it to take 2 days and it takes 3 days, you have one data point, with one variation of 1-day (or 50% of it's expected duration - average absolute variation of 1-day). If you then get another task and you estimate it to be the same size and it takes 1-day, then you have a range of total variation of -1 day (delivered early) to +1 day (delivered late) which is 2 days in total. You can't make a decision on one data point. Now, let's suppose you classically estimate ten such elements (deliberately staying away from 'story' as to me, a story is an end-to-end, stand alone piece, so shouldn't have a classical dependency per se) in a dependency chain on a critical path and you don't improve your process to attain consistency, the total absolute variation goes from all of the tasks being delivered early, to all of them being delivered late. From the mean (2 x 10 = 20), this becomes a range of -10-days (1 day early for each task) to +10-days (1 day late for each task) a total absolute deviation for the whole project of 20-days on a 20-day expectation, even though the individual tasks still have an average total deviation of 1-day! Let's now imagine we're actually delivered stuff and look at the variation of the tasks remaining after these first 2 tasks on the board have been delivered and their variation was as stated previously. Those are now not uncertain. They have been delivered. There is no future uncertainty about those tasks and of course, no need to further estimate them. The only variation now exists for the remaining 8 tasks on the board. Again, 1-day average absolute variation, means the 8 tasks remaining now have a total systemic (i.e. whole project) variation of -8 to +8 days (16-days). So you can see the variation reduce as you deliver stuff. It's reduction makes that darn cone to look like it does! Since you're now 4 days into the project. You can plot that on a graph.The first point of uncertainty was +10 and -10 on day zero. 4 days in, this has reduces to +8 and -8. 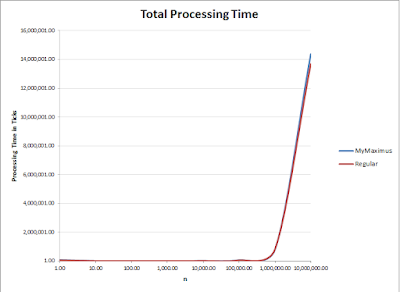 You keep going across the time on the x-axis as you deliver stuff and you always get it finishing on a final point. After all, once you have delivered everything, you have no more variation to contend with. Zero, zilch, nada! There is no getting away from this fact. It's as much of a fact as the law of gravity. To do anything that goes against it without understanding it, is like this. Which whilst fun and harmless (some might consider 'pioneering'), killed people when flight was first invented and in any case, spends money pointlessly, which is waste. We are in a position where we know better, why reinvent the wheel? What does this have to do with Estimates? Right, here is where we get back to the meat of the matter. 'How do estimates help me deliver better software'. In short, as far as software development alone is concerned, it doesn't. However, and this is the bit that ired me because people just didn't seem to want to hear it, software development by itself, is useless. We use software to solve problems. Without the problem, there is no need for software (indeed, there is no need for any solution). However, don't forget organisations themselves solve client problems and those clients themselves solve problems potentially for other clients! So software development doesn't exist in isolation. If you think it does, then you exist in the very silo mentality that you purport to want to break down. Do you not see the hypocrisy in this? I am sure many of the business readers do! Teams Should Aim to use the closeness of their estimate and actual delivery performance as an informal internal indicator of the level of understanding of the codebase and their performance with it. No more. Businesses should not use the estimate to hold the team to account as there is a high level of variance around any numbers and the bigger the system being built, especially if it has a number of components in a chain, the worse the variance will be. The way to improve on estimates totally depends on the way the team itself works. Let's assume the team carried out retrospectives. This is their chance to employ practises to improve the way they work, quality of the work and/or pace at which they develop software. As a rule, the team can't go faster than it can go, but the quality of the code and the alignment of the team naturally affects the flow of tasks carried through to 'done' (production, live, whatever). Blockers and bugs naturally affect the flow of work through the team. Reducing them, improves the flow of work, as contention for the 'story time' of the team, which is a constrained resource, then isn't there. If you don't track bugs/blockers, then you are likely losing time (and money, if you're not working for free) as well as losing out on opportunity costs or potential income (probabilistic) in value for the business be delaying deployment into done and you'll have no idea if that applies or not. If it does, the business is getting hit on two fronts. The combination of the effects of the first and the second hits your NPV and hence, directly affects your IRR and also ROR and ROI (buzzword alert). However, most developers are too far away from finance to understand this and many who purport to understand it, don't. How can methods like Kanban and ToC help? OK, so it's no secret the IT world, the one I inhabit, has an extremely poor understanding of flow and indeed, does kanban 'wrong' relative to the real way lean happens in manufacturing and TPS. Kanban ultimately aims to optimise flow of X. Flow of stories, tickets, manufacturing items, cars, whatever. Transportation of goods (read stories) is a movement of one item from one stage, to another. Often a development context to a QA one or into live. There is a change of 'mental model' at that point, from one mindset, say, development, to another, say QA. That is a form of context switch, just not using time, which shouldn't be new (after all, context switching happens with stack frames on CPUs when multi-threading - Take out and store the stack frame for one thread, introduce the frame of another) and just like all context switching, it never costs nothing to do. In addition, as per ToC (buzzword alert), there is inventory, and indeed, a 'wait time' between stages where the item is ready to be pulled on demand can be considered an implied 'inventory' stage. This introduces another cost. Usually in not delivering the software into a production environment so it starts to yield knowledge or indeed, it's value. Run a dojo and try this. Take one developer and make them code and QA one scenario. 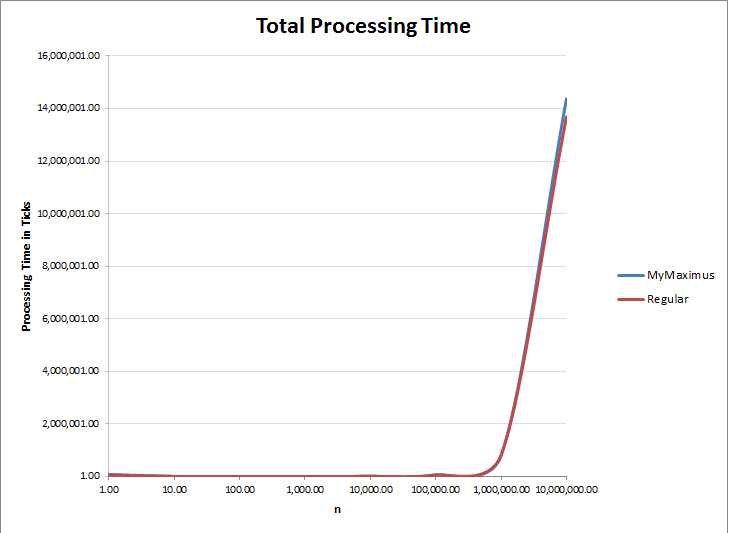 Time how long it takes to deploy that one thing into a production environment. Then take another developer and a tester and make them code one scenario and then QA that one scenarios in sequence. Time how long it takes. You'll never get faster with the QA and the dev. The cost to switch the task naturally elongates the cycle-time of the software delivery of that one task. If you did 10 tasks like this in an iteration, all sequential and the dev didn't pick up another one until the QA signed it off for live, then the throughput would be just 10 x the cycle time. In short, introducing a kanban stage has introduced waste! You'd lose time/money as a business. What's the benefit for this cost? What's the trade-off? Still think so now it's been explained? The systemic trade-off is pipelining tasks to make team delivery faster ( to be delivered by the team). Each stage can pick up a 'ready' task from the previous stage when they've finished their main involvement in their stage/phase of the story's flow through the pipeline. Run the same experiment with 10 scenarios and this time the dev can pick up a task whilst the QA is testing the previous one. Suddenly this makes much more sense and your throughput, whilst still related to cycle-time, is not wholly dependent on it. So you are delivering the 10 scenarios much faster than you would do if it was sequential. After all CPUs use pipelining as a standard optimisation mechanism. This is obviously why we do what we do in the way that we do it in software, lean manufacturing, lean construction or anything else. Can you get too small? As I demonstrated in a talk I gave last year, the short answer is yes. If you keep adding columns to the point it doesn't add value i.e. isn't a step in the value chain (buzzword alert) then all you are introducing is the cost of the context switch out of that stage, with no value add, which then costs both time and money. Indeed, if you can run tasks wholly in parallel pipelines, it's much faster than kanban, but requires resources to be allocated accordingly. To see this in the previous example, introduce a post-QA stage called 'stage' and all they do is sign a pieces of paper and then run a manual deployment. There is no value add in that process, since there are no other contentions for the 'stage' process in the organisation as it is at that moment in time. However, you're paying a post-QA personnel member money to stage it. I hope folk can now see where I am coming from. However, make no mistake, I am extremely disappointed in the quality of understanding around this, the hypocrisy that exists in the field and the low down, dirty tabloid style tricks that some folk will stoop to just because they've never come across such a scenario, and as if they know it all from all organisations everywhere. The #NoEstimates movement is sadly littered with such folk who frankly seem to show a distinct lack of understanding of anything related to the field. Many show a distinct unwillingness to engage, inherently overly political standpoints to avoid having to admit a failing, limited success or understanding. After all, the only people who'd want to sell #NoEstimates if it doesn't mean anything are the #NoEstimates movement. It's a real shame as it's something I think needs to be discussed with a wider audience and as I have said previously, it has massive potential, but is being taken down a black hole with pointless discussion and constant justification across the board. After all, if we can't constantly be responsibly critical of our field, our means of operation, then we can never ever improve what we do? Story Points: Another tool, Not a Hammer! Nope. Still can't knock that alleged sense into me. I'm not all that bothered about story points. I use them a lot as they were intended. Relatively sizing tasks. I often also find myself using T-shirt sizing or occasionally Size, Complexity and Wooliness. They all have their merits depending on what the teams I work with decide they wish to use. The biggest problem is when I find some proponents of various methods, including of course Scrum, XP, RUP, Waterfall etc. trying to impose their way of thinking as the right way of thinking. We're just as guilty of this in the agile world as the 'waterfall' managers we often criticise. Truth be told, with estimates, I don't care a jot which we use. If you believe every situation is different, then you should expect that the tools used may well be different and that's OK. Many proponents standing against story points seem to fail to realise that a story point link to the real world exists whether we like it or not. A story takes time to do. You don't have negative time and you can't carry out zero duration tasks. It also doesn't cost zero, because the developers wages or rates are being paid (yes, you ar coting the business money - Sorry but it's true. Even if you work for free and are late you lose the company an opportunity cost). That is just as much a reality as the law of gravity. Just like gravity, your mind has to escape to outer space to escape that reality. The value a story delivers can also be quantified and analysed statistically. All of these re-quantifications have units of measure which can legitimately be attached to the parameter. To recap, in A-level maths (senior high for those in the US and a heck of a lot younger in many other countries), most people should have come across the concept of a parametric equation. It usually includes a variable which itself has no units to simplify the process of reasoning about the model at hand. Consequently, it allows for much easier expression of much more complex structures and concepts in easier to use form. In a tenuous way, it's akin to the mathematical equivalent of using terms such as SOLID, IoC, TDD, BDD etc. since just using these words helps communicate ideas where communication is the goal. Just like in the software world, there is often a transformation in and out of the real world context of parametric equations (read, parameters). This is a normal, analytical approach to many problems in many more industries than software development or engineering. The only difference between these is that parametric equations contain a stochastic component when working with flow of tasks across a board. That doesn't often change the approach needed, just the skill of the person using them (which may or may not be desirable). But guess what? So do story points. Story point are just a tool. A tool like any other. If you misuse a tool, who is at fault? Now #NoEstimates #BeyondEstimates. I'd love for us to drop the NoEstimates term. It's got the dev world in the space of the top of the Gartner hype curve for absolutely no reason. #BeyondEstimates is a much better term for selling it, sure, but it also communicates the intent much much better. It's a term Woody Zuill came up with himself, which I think perfectly positions and communicates the goal of the movement. NoEstimates isn't about not estimating. It's about always looking to improve on estimates. So '#NoEstimates' is one of the worst phrases you can use to describe it. Plus, just like any tool, I suspect it's misuse will leave you in no better position than the standard evolving estimation processes, just with less understanding of where it all went wrong. That said, overly precise estimates will leave you in worse positions than you'd otherwise be in. Get good at deciding how much effort needs to go into estimating things. Yes, but what do you mean by 'wrong'? Wrong as in you'll never hit it? Yes. However, what's an acceptable deviation? For example, do you get out and measure your parking space at work before then renting a fork lift truck to lift your car and spending 8 hours positioning it perfectly in the space with millimeter precision, only to have to get into it at the end of that day to go straight home? No, I suspect not. You estimate the position of the car in the space, sample the space to make sure you can get out or are in the spot and there we go. Job done. 15 seconds. The amount of waste is the amount of unusable extra space around your car and even that definition depends on who you are. Statistically, most people are likely get into that space on their first try. Second and third try includes almost everyone. 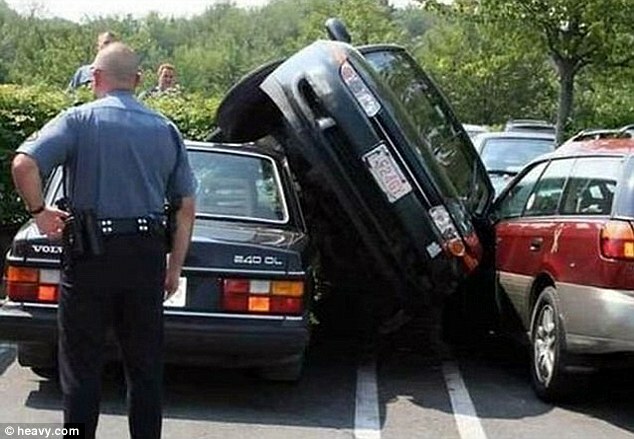 However, nobody attempts to just crash their car into that spot. That is good enough. Is it 'wrong' if measured by the deviation from the very center of the space? It certainly is! Is it good enough for the job? Yes it certainly is. Is this your #NoEstimates approach? In reality, the #BeyondEstimates movement is right to ask the question of the role of estimation in software development projects and beyond (pun intended). What I don't want to see though is people blame estimation methods or worse, maths, for the failings of people. That was agile c2000+ when most folk adopted the wrong ideas around agility and I can't stand to see another 10 years lost to needless bad practice. This all means that teams have to get better at managing variation. Product owners have to get better at managing their own 'expectation' around that variation and both have to keep track of the scope of their deliverables and how likely they are hitting the commitments they make. Overall the culture has to support pivots, backtracking and encourage the raising of issues and also the organisation must be able to support changes of direction. This is a much bigger problem than either 'party' can solve alone.